Ellie Lerner’s already problematic life is turned upside down when her best friend, Lucy, is murdered while walking her daughter, Sophie, to school. Ellie flies to London to be with Lucy’s husband, Greg, and daughter, leaving behind her own husband, Phillip. “I need you here,” he says, but we both know he is pretending. 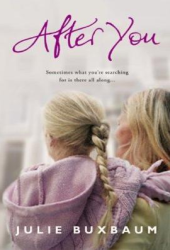 After You is a story about friendship – a long complex friendship between women who have known each other virtually their whole lives. The novel tells the story of Lucy and Ellie in anecdotes Ellie recalls during her time in London. When you meet someone at the age of four, tumbling and doing the “downward doggie” in Mommy & Me yoga, and their house is just two blocks away and they make you laugh for over three decades, starting their first day when she stuck out her tongue and made stupid faces behind the yoga teacher’s back, a friendship is inevitable. Maybe even fated. But as Ellie settles into her life in London, she begins to realize that she didn’t know everything about Lucy. In many ways, Ellie is closed off to possibilities. Instead of dealing with her marital problems and the issues that precipitated them, she decides that she will stay in London where she is needed and wanted. As a way of helping Sophie cope, Ellie starts to read her Frances Hodgson Burnett’s magical book The Secret Garden. Burnett’s book, if you’ve never had the pleasure of reading it, is a book about grief and renewal. As they read, Ellie and Sophie book begin the process of letting go of their pain. Buxbaum’s novel tackles some big questions: what do you do when you’ve been betrayed? how do you move on? how do you forgive? is it really possible to have a second chance at love? I think she does an admirable job in After You. Ellie is a likeable character; in fact there are no bad guys here – just people, doing their best to live their lives, however imperfectly. This entry was posted in Book Chat and tagged 2011, literary fiction by Christie. Bookmark the permalink. Thanks so much for taking the time to read AFTER YOU and for the lovely review! I so appreciate it! Thanks for stopping by, Julie. I did enjoy your book very much.